Hello Everyone 🙂 This is Alyssa from Cooking From A SAHM http://cookingfromasahm.blogspot.com/ . I’m so excited to share this recipe with you while Nettie is away! I”ve known Nettie for a long time. I don’t quite remember when we first met online but I’m sure glad we did. We’ve become great friends and shes always there for her friends. Nettie is away helping a friend out, so her friends decided to help her out. 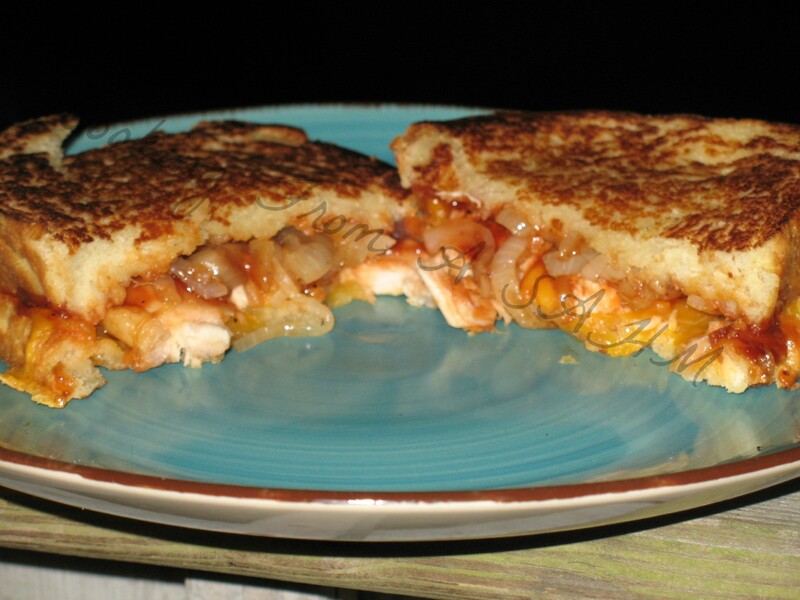 Today I’ll be sharing with you my recipe for BBQ Chicken Cheddar Grilled Sandwiches. One day I came up with the recipe and made it that night. It sure was a hit, and you know whats better? It is AWESOME leftover. I’m always up for a cheesy chicken sandwich and this one is kind of a take on a sandwich I get at our local Friendlys. I hope you enjoy it as much as I do. In a pan put a layer of bbq sauce, then place your chicken breasts on top. Top with more bbq and brush it on. Bake for an hour till chicken is done. Set aside. In a skillet put your oil, sugar, salt and pepper and toss onions in it. Cook down the onions till they start to turn brown and clear. Set aside. Take a slice of bread and spread butter on one side. Put it in the pan butter side down. Add cheddar, chicken, bbq sauce, coleslaw(optional) and onions. Take second slice of bread and spread with butter. Place it butter side up. Cook till cheese has melted and the bottom bread is grilled. Smash it gently. Flip it and cook it till the last slice of bread is grilled. Cut it and eat it. ENJOY!